StackAnalyzer automatically determines the worst-case stack usage of the tasks in your appli­cation. It lets you find any stack overflows, or formally prove the absence thereof. Detailed and precise information on user-stack usage and system-stack usage by application tasks. Freely selectable entry points for the analysis. You can easily focus on any code parts of particular interest to you. Control-flow reconstruction directly from binary code. Potential flaws in the debug information will not confuse StackAnalyzer. Fully integrated, feature-rich graphical and textual viewers for control flow, analysis results, source code, assembly code, and configuration files. Customizable XML reports for documentation and certification. Optional ValueAnalyzer add-on for static analysis of register and memory cells, memory accesses and function calls. Seamless integration with other analysis tools from AbsInt (e.g. aiT for worst-case execution time analysis). Batch mode for easy integration with other tools, or into automated build processes. Airbus France, in the development of safety-critical avionics software for sever­al airplane types, including the A380. Daimler, in many auto­motive software projects, including the powertrain control system of the new Actros truck. Honda, in developing the FADEC software of a turbofan engine. Vestas, to prevent stack overflow in their wind turbine control software. Framatome, for verification of their safety-critical platform for testing, operating and troubleshooting nuclear reactors. Continental, to avoid stack overflows in their airbag control systems. OHB, in the development of onboard software for satellite platforms for communication and navigation. u-blox, to avoid stack overflows at compile time and to increase the reliability of their controlling software. MTU Friedrichshafen, to demonstrate the cor­rectness of control software for emergency power generators in power plants. StackAnalyzer reduces the development effort and helps prevent runtime errors due to stack overflow. 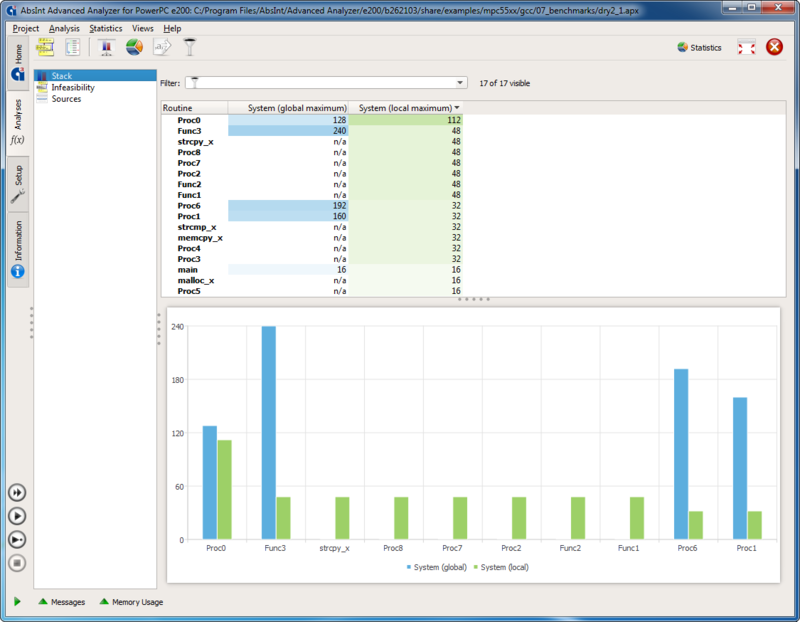 StackAnalyzer calculates the stack usage automatically. No testing or measuring required. The analysis results are valid for all inputs and any task execution. StackAnalyzer directly analyzes binary executables, exactly as they are executed in the final system. Using StackAnalyzer is essential in meeting current safety standards such as ISO 26262, DO-178B/C, IEC-61508, and EN-50128, where statically analyzing the stack usage is part of the architec­tural safety requirements. 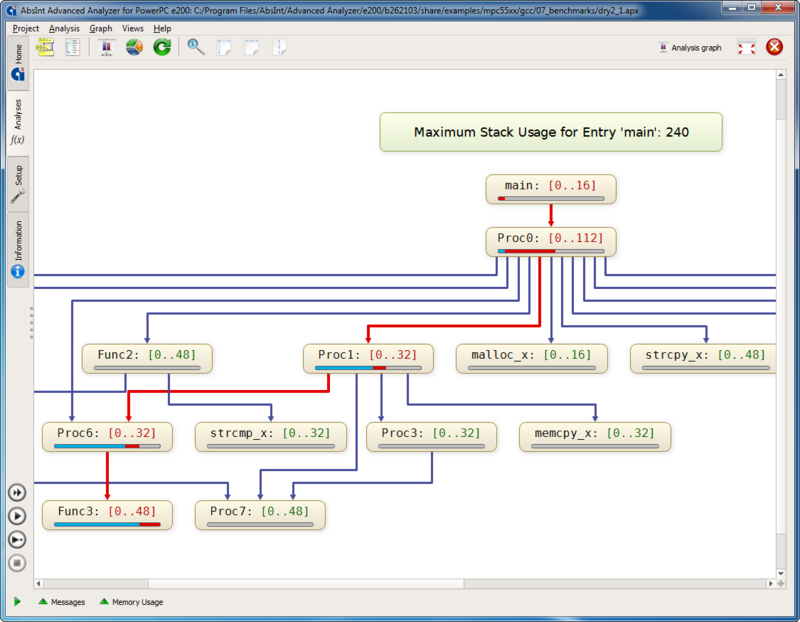 StackAnalyzer is available for a wide and ever-growing array of target processors and compilers. Your usage of StackAnalyzer can be qualified according to ISO 26262, DO-178B/C, and other safety standards. We offer special Qualification Support Kits that simplify and automate the qualification process. These Kits have been successfully used by many customers in their qualification processes, notably in the avionics and automotive industries. Additionally, we offer QSLCD Reports that document our own development processes, including all verification and quality assurance activities. Lastly, StackAnalyzer is also available as an integral part of the SCADE development envi­ron­ment, which is DO-178B qualified up to level A for Military and Aerospace Industries, IEC 61508 certified at SIL 3 by TÜV for Heavy Equipment and Energy, and EN 50128 certified at SIL 4 by TÜV for Rail Transportation. Within SCADE, you’ll find the tool under the name Stack Verifier. Request your free trial package today, complete with free training and support.